This is probably not news to most VMWare users: Even with the latest VMWare Workstation 9 version, there is still no support from VMWare to boot from a USB drive. The workaround most people use is to download Plop Boot Manager from 'http://www.plop.at/en/bootmanager/download.html', which acts like a bootable CD and gives you a list of menu options to boot from, one of which is 'USB' (see the screenshot). On the first (work) day of the new year, I decided to upgrade my primary work machine to Windows 8. I was not however ready to be 'down' in case things did not work out well, so I did a fresh install on the second drive. OK, what's all this fuss about Windows 8 being Vista-2? Reading about lots of complains and all the talk about steep learning curve etc. I was expecting to be frustrated. Instead, I felt quite at home. All the usual keyboard bindings I am used to worked, I was able to quickly find any application I needed to run. 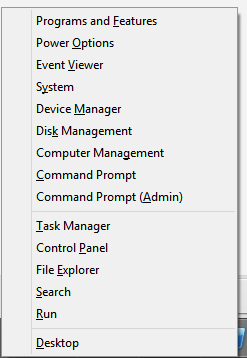 Similarly it felt natural to locate power settings to tell windows not to shut itself down when I am not using it. To be fair, I might have been frustrated if I was put in front of a Windows 8 box without knowing a single thing about it. I knew a couple of things like 'Charm' bar, how to 'close an application' via mouse gesture, but that's pretty much it. I guess Microsoft could have done a better job of training people during set up or by providing some sort of welcome wizard showing people how to accomplish most common tasks to get people going. The first thing I did was to visit Windows AppStore to see what's available. There are bunch of 'apps' in there, though not much really. It felt more like Chrome Apps, which are 'mostly' links to existing web pages. 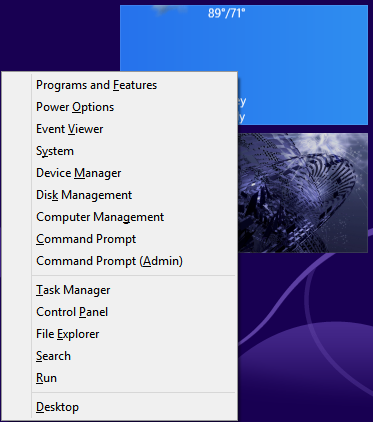 I always like to use keyboard shortcuts, so I installed a couple of apps like "Windows 8 Shortcuts", I installed. Well, things got in the way and I could not get to finish this blog post as I intended to. I've been using Windows 8 extensively and have a much better notion of good and bad now. But before I list any of them, I would suggest anyone reading this to stop here and take a look at Paul Allen's Windows 8 review. It covers pretty much everything I wanted to touch upon if I had finished this post in the first few days as I initially aimed. 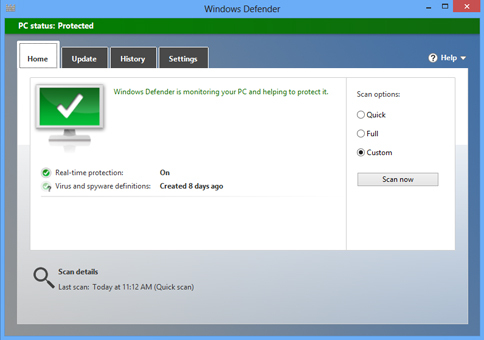 As described here by Microsoft, Windows Defender is essentially the Antivirus previously included in Windows Essentials. Like Apple's XProtect, Microsoft built this feature into the OS. Then, I run a full disk scan and check the results. Comodo, for example had detected a file in a different folder that none-other had detected before. I uploaded that file to VirusTotal.com, which runs many common anti-virus engines and reports the results. Not surprisingly, Comodo was the only AV that reported it: a false positive. Anyway, Windows Defender detected all of them successfully when I did a full scan, which is good because I had replaced Microsoft Essentials a year ago as it had failed to detect any. Yet, I may still need to disable Windows Defender and go with a different solution, not because of its detection rate but because I am suspecting that it has a bug that causes Windows Explorer to crash. After doing an in-place upgrade from Windows 7, I did not notice any issues for a couple of days but then started to notice that sometimes taskbar would just disappear and re-appearing. I know from experience that this happens if Windows Explorer crashes. When I checked the Event Viewer, sure enough I saw Event ID 1000 Errors in the Application log and a couple of "Information" entries afterwards that told me "The shell stopped unexpectedly and explorer.exe was restarted". I browsed to the problem folder and scrolled down quickly. Explorer crashed. Repeated this a few times and Windows Explorer kept on crashing each time. Then I brought up Windows Defender > Settings > Real-time protection, and Turned it off. Repeated the test above. This time Windows Explorer did not crash. I am not fully convinced that Windows Defender is causing the Windows Explorer crash yet but it is the primary suspect at this point. 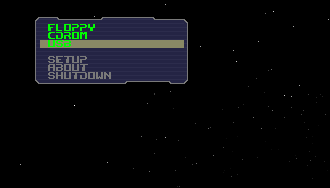 I still need to do more testing and possibly take a crash dump to see if there any clues there. I have two monitors attached to my machine. One of the features of Windows 8 was native support for multi-monitor situations, yet I am not sure I like the implementation. My first "annoyance" is with bringing up Windows Charm Bar (Win + C), which is supposed to show up when I am point at the upper right corner edge of the screen. That works, but it is not smooth. Sometimes, mouse will jump into next screen and I have to pay special attention to where exactly I am pointing it to. The second "annoyance" is about the taskbar, it is mirrored on each screen. 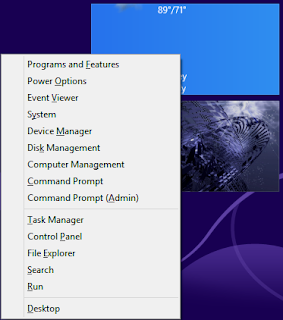 It seems redundant to me but I could not yet find an option to tell Windows 8 to display it only on one screen. Alt + F4 -> Closes active window, keep doing it and you can even restart windows. "Win + X" shortcut displays a menu at the bottom left corner of Desktop, where "Start" menu used to be. The bottom option will take you to Desktop as well. I personally felt it was well worth spending $40 to get this upgrade. Microsoft is here to stay with us for quite some time and so is Windows. Adapting to new environment is a "built-in feature" of human beings as is resisting to change yet as we learned from Star Trek "resistance is futile" (extra points if you are playing Ingress and you are 'Englightened'). I am sure Microsoft will keep on ironing out pain points for users and make the UI better but no, Metro is not a disaster and as far as I can tell, Windows 8 is an OK release so far. PowerShell AD module make checking group membership a trivial task. If I wanted to get the list of members for a group, I can use Get-ADGroupMember cmdlet. Problem with module is that, it's an 'extra' component on top of standard installation and if you will use it, you need to make sure that your script will have access to it. You may be using PowerShell as your logon/start-up script and your machines may not have the AD module. Yes, there are techniques remote-session techniques that can be employed to work around this but most would prefer to enumerate group members some other way. I noticed that this stopped working for a specific group, and when I manually looked into the group properties, I found that "member" property of the group was empty. There was; however, another noticeable property that got populated instead: "member;range=0-1499". Long story short, when members of a group exceed 1500, AD was populating that property instead of plain 'member' property and I needed to use a different technique called 'ranged retrieval'. The main change is that we use 'PropertiesToLoad' property to feed $searcher object the range of members we would like to get and loop through them. When we give $searcher object an invalid range, it throws an error at us and we catch that to exit the loop. Here is the modified function. $rangedProperty = $result.Properties.PropertyNames -like "member;range=*"